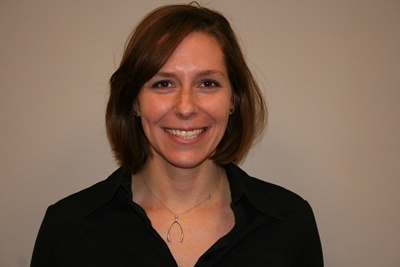 The fitting range visual, often found in fitting software or product brochures, are often consulted during the hearing instrument selection process. A quick glance of the fitting range and the patient’s audiogram can tell you if the instrument will provide the gain needed for appropriate amplification…. or can it? Let’s start with a look at the fitting ranges. Below are four fitting ranges, as displayed in the respective fitting software, for similar receiver-in-the-ear products. The fitting ranges are made up of several ingredients which include the electroacoustic specifications in the coupler, the real-ear- to-coupler difference along with the coupler response for flat insertion gain, and the fitting prescription. In addition, there are a few “non-standard” ingredients that vary from manufacturer to manufacturer and even from model to model. These ingredients can include the safety margins for volume control ranges and feedback avoidance, and even commercial considerations (i.e. comparing to similar products from other manufacturers). 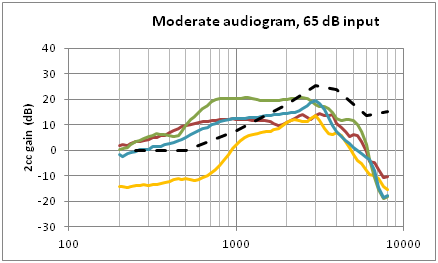 As an investigation we fit each device for the same audiogram with the “first fit” formula, and then measured them in a coupler with a 65dB input signal. As shown in the graph below, coupler measurements yielded very different gain settings. The black dotted line represents the targets for NAL NL2 fitting prescription while the various colors represent the four devices. You will notice that the measurements, particularly the green and yellow, differ quite a bit from each other. But the fitting ranges looked nearly the same – why are the gains so different? The reasons for these differences are the fitting prescriptions, mentioned as one of the ingredients, as well as the non-audiometric settings. The fitting rule can be selected in the fitting software so had we set all of these fittings to NAL NL2, rather than using the manufactures proprietary fitting rules, we likely would have achieved a closer match, but there is more to it. The user experience level is one example. 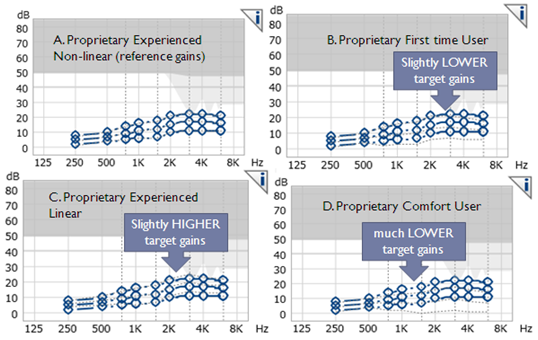 Below you can see four different gain targets, for the same audiogram. The blue gain curves represent the gains as set for an experienced user. The light blue dotted curves will indicate the variation in targets for the default gain setting based on the experience level. The non-audiometric settings can have a great effect on the gain settings. The message here is this: Fitting ranges are not standardized and are not an indication of what you will end up with during a first fit. Along with instrument specification, manufacturers use several different ingredients to create fitting ranges and prescribe gain settings in the fitting software allowing for quite a bit of variability between manufactures and settings. Remember to always check your fitting rule and settings. And of course, you can always verify the fitting and get to the bottom of it once and for all. Stay tuned for the next edition of “Tips and Tricks for the Super-Fitter”! This entry was posted in Fitting, Global Audiology Monthly Column, ReSound Newsletter and tagged Super Fitter. Bookmark the permalink.